The MeeGo project, a joint Linux-based venture between Nokia and Intel, announced the release of MeeGo 1.0 core software platform for netbooks. The project, which combines Intel's Moblin project and Nokia's Maemo initiative, released its 1.0 API last week. In addition to the API and Qt 4.6, the MeeGo software platform also includes a robust SDK with some pretty powerful open source tools. Ofono telephony, Conman connection manger and BlueZ, the official Linux Bluetooth protocol stack handle communications. DeviceKit and udev manage the OS's interactions with hardware devices. While the default filesystem is BTRFS. The entire MeeGo 1.0 OS is based on the 2.6.33 build of the Linux kernel. MeeGo 1.0 also works on Nokia's N900 smartphone, but added handset support will come with the June release of the MeeGo Handset user experience. The OS comes packaged with Chrome as the default browser, but Chromium is also available. 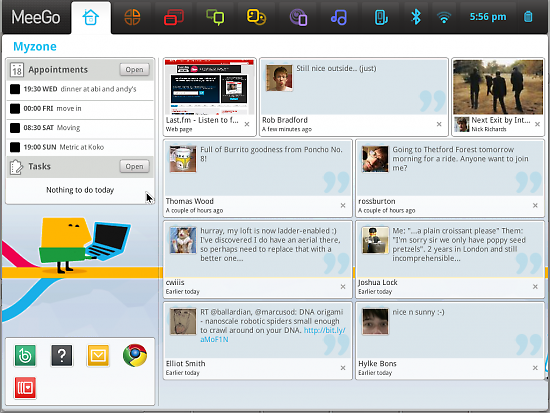 The MeeGo Handset user experience will come packaged with Fennec, the mobile version of Firefox. The development tree for 1.1 is already open with touch support for handsets, tablets and car-mounted infotainment devices such as GPS confirmed. MeeGo 1.1 will be released in October, but developers will have access in June. Future releases of MeeGo are planned on a six-month schedule. For more information including links to botht he netbook and N900 versions of the OS, head to the MeeGo community blog. Maemo Update to Allow N900 to Dual Boot with MeeGo. Not the full experience, but we'll take what we can get.